Temecula, Calif. – FFF Enterprises, Inc., the nation's largest and most trusted distributor of plasma products, vaccines and critical-care biopharmaceuticals and publisher of two magazines, is pleased to announce that it has received a platinum award, two gold awards and one honorable mention in the 2011 MarCom International Awards Competition. BioSupply Trends Quarterly (BSTQ), a leading source of marketplace news and trends within the biopharmaceutical industry, won a Platinum award for its feature article A World Without Vaccines. 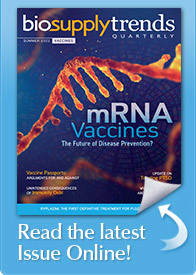 The publication also garnered a Gold award for its State of the Biologics Marketplace special insert, and an honorable mention for its July magazine cover design.Â IG Living, the only magazine dedicated to patients who use immune globulin products and their healthcare providers, received a Gold award for its April/May issue. FFF is no stranger to accolades such as these; both of its publications took top honors in last year’s MarCom competition as well, and BSTQ was named among the top 10 pharmaceutical magazines for 2010 by Cision, while IG Living was recognized by Health Information for its outstanding patient education information . “It’s an honor to be acknowledged for our publishing and marketing efforts,” says Patrick M. Schmidt, chief executive officer, FFF Enterprises, Inc. “Both of our magazines have already been distinguished with numerous awards. We’re very proud of our marketing communications team. MarCom is an international organization consisting of several thousand creative professionals. The association oversees awards and recognition programs, provides judges and sets standards for excellence. The annual MarCom awards recognize outstanding creative achievement by marketing and communication professionals. FFF was distinguished among nearly 5,000 entries from throughout the United States, Canada and several other countries. Winners were selected from over 200 categories in seven forms of media and communication efforts- marketing, publications, marketing/promotion, public service/pro bono, creativity and electronic/interactive. About 15 percent of the entries won the Platinum Award, the organization’s top honor. Temecula-based FFF Enterprises is the largest and most trusted distributor of plasma products, vaccines and other biopharmaceuticals in the U.S. Founded in 1988, FFF is now in its 23rd year with more than a billion dollars in annual sales and a flawless safety track record. FFF has taken a leadership position in regards to supply chain safety and innovation, setting new standards and pioneering industry firsts. FFF’s commitment to Guaranteed Channel Integrity™ ensures that products are purchased only from the manufacturer and shipped only to healthcare providers, with additional steps taken to safely store, handle and ship products to ensure patient safety is never compromised. FFF’s proprietary systems, Verified Electronic Pedigreeâ„¢ and Lot-Trackâ„¢, provide verification of this secure channel, and FFF’s MyFluVaccine (www.MyFluVaccine.com) and VaxAmerica (www.VaxAmerica.com) are revolutionary vaccination programs that have added a new level of safety, convenience and reliability to both healthcare providers and consumers. BioSupply Trends Quarterly (BSTQ) is a quarterly magazine published by FFF Enterprises, Inc. BSTQ has a national distribution to more than 50,000 general practice physicians, hospital and clinic chiefs of staff and buyers, pharmacy managers and buyers, specialist physicians and other healthcare professionals. The publication’s mission is to serve as the industry’sleading resource for timely, newsworthyand critical information impacting thebiopharmaceuticals marketplace, whileproviding readers with useful tips, trends,perspectives and leading indicators on topics pertinent to their business. IG Living is the only magazine dedicated to patients who use immune globulin products and to their care providers. IG Living launched its first bimonthly issue in February-March 2006, with an initial distribution of 25,000 â€” direct to patients and their physicians’ offices. Regular features include such topics as product and manufacturer news, resources for healthy living, immune globulin treatment options, reimbursement and clinical trials. IG Living is published by FFF Enterprises, Inc.